After analyzing the overall themes of the research for our project, our group has determined the three cornerstones of successful early childhood development. These cornerstones are government and NGO support, school, and family. The balanced combination of these three pillars creates an environment for the children to realize their full potential within their education, which sets the foundation for the future of South Africa. However, there are many conflicts that must be overcome to allow for the highest quality of ECD. 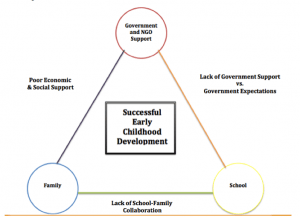 The diagram below, figure 1, has been developed to represent these three cornerstones of successful ECD and the three potential conflicts between them. 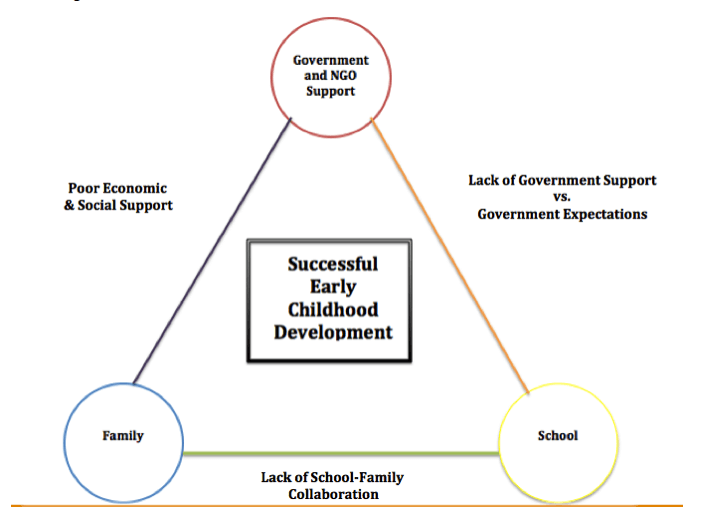 Figure 1: Triangle Model of Successful Early Childhood Development adapted from Scott Campbell’s “Green cities, growing cities, just cities? Urban planning and the contradictions of sustainable development” (Campbell, 1996). As discussed under Models of Early Childhood Development, family-school collaboration is necessary in order for a child to receive quality early childhood education. Unfortunately, this collaboration is not always available to all children. There are three types of factors that limit family-school collaboration: community, family, and school (Raborife, Phasha, 2010). Community factors include the lack of safety for women at night due to poor infrastructure, such as lack of lighting in settlements thereby making women unable to attend their child’s school meetings at night. Family factors include time constraints of parents and in some cases, limited understanding of ECD. Due to poverty and illness in Cape Town, many children are orphaned and are lacking any parental figures at all. School factors include the insensitivity of teachers to children and parents due to bias and racial conflicts. Poor communication and an unwelcoming environment is a result of such bias (Raborife, Phasha, 2010). Family-school collaboration is vital in motivating children and leading them to a productive and enjoyable ECD experience. The collaboration between the government or NGOs and ECD centres also plays an important role in the child’s development. In order to receive financial assistance from the government, an ECD centre must register with their local municipality. In doing so, they must meet regulations set by the South African government. If the centre does not meet the regulations and cannot afford to make the upgrades necessary to meet the regulations, then they will not receive the aid they need. When this unfortunate situation occurs, some centres may turn to the support of NGOs. Though some NGOs do not offer financial support, they do offer many types of training programs to ECD centres throughout South Africa. The downside of working with NGOs is the limited availability of the programs and areas in which they are located. The challenges between families and government include issues that should be resolved as ECD standards improve with time. The issue of truancy though can only officially be enforced by the government should be taken on by parents as well. Also the lack of support given by the government makes it nearly impossible to ensure that there is an ECD centre within traveling distance from all citizens’ homes. As difficulty in traveling to and from the centres increase, families’ willingness to incorporate ECD in their child’s life, in many cases, diminishes. With improvements in these areas we may see an increase in the amount of children who participate in ECD programs throughout South Africa.